HÀ NỘI — Vietnamese shares joined the global market downturn tumbling in two main stock exchanges on Friday. Buying demand was weakened but selling pressure increased at a high level, causing a series of large cap stocks to drop significantly. Shares sank into the red across at the Ho Chi Minh Stock Exchange, pulling the VN-Index down 1.29 per cent to 914.29 points. The HNX-Index on the Ha Noi Stock Exchange dropped 1.46 per cent to end at 103.01 points. Liquidity was modest with just 187.7 million shares worth a combined VNĐ3.6 trillion (US$154 million) traded. The large-cap VN30 Index was down 1.64 per cent to 885.65 points at the end of the session. Bank stocks were hit strongly with Vietcombank (VCB), Vietinbank (CTG), Techcombank (TCB), Military Bank (MBB) and BIDV (BID) slipping more than 2 per cent each. The US Federal Reserve held interest rates steady Thursday but remained on track to continue gradually raising borrowing costs, pointing to healthy economic prospects that were marred only by a dip in the growth of business investment. Global oil prices fell to multi-month lows as supply increased and investors worried about the impact on fuel demand because of lower economic growth and trade disputes. Benchmark Brent crude oil fell to its lowest since early April, down more than 18 per cent since reaching four-year highs at the beginning of October. US stocks sank with the S&P 500 and Nasdaq closing slightly lower on Thursday after the Federal Reserve statement, and energy stocks were the biggest drag on the S&P as US crude oil prices fell. The S&P 500 lost 7.06 points, or 0.25 percent, to 2,806.83 and the Nasdaq Composite dropped 39.87 points, or 0.53 per cent, to 7,530.89. Vietnamese energy stocks were also pulled down by a slide in global oil prices. Notable Viet Nam National Petroleum Group (PLX), Petro Vietnam Gas JSC (GAS), Drilling Mud Joint Stock Corporation (PVC), PetroVietnam Drilling & Well Services Corporation (PVD) and PetroVietnam Technical Services Corporation (PVS). Asian stocks pulled back from a month high yesterday as the Federal Reserve looked set to deliver another interest rate hike next month, paring gains made earlier this week after the US midterm elections triggered a global equities rally. 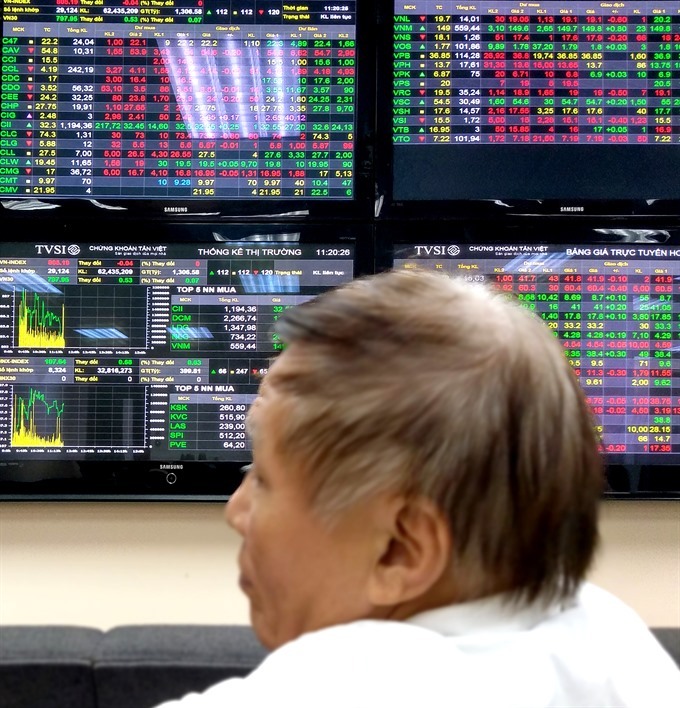 Asia’s main stock indices also underperformed, with the Nikkei 225 and Shanghai Composite Index losing more than 1 per cent while the Hangseng index slumped 2.4 per cent. Weakening cash flow and the negative impact from international markets caused Vietnamese stock market to easily decrease. According to Việt Dragon Securities Company, investors should reduce their short term trades due to the unpredictable market.